Remember that expression, “red letter day”? This was one in my Cascabel birding life, though I couldn’t have expected it to have been, out on the desert and in the now about-roasting heat that was heading towards 100 degrees. Pat, Roby, our neighbor K. (who often joins in on riding for cattle affairs) and I left out horseback for Cascabel Pasture in late morning, which moment finds the prickly pear cactus in perfect bloom in all their variety … they look like roses or water lilies or tulips, are not wilting even if we are, are startlingly clear yellow with glowing green pistil, or the color of creamsicles, topaz, orange-yellow with a red spot at the base of each petal, bright yellow with a hot pink stripe up the centers. “Hey, is that an eagle on the top of that saguaro?” Roby called out. 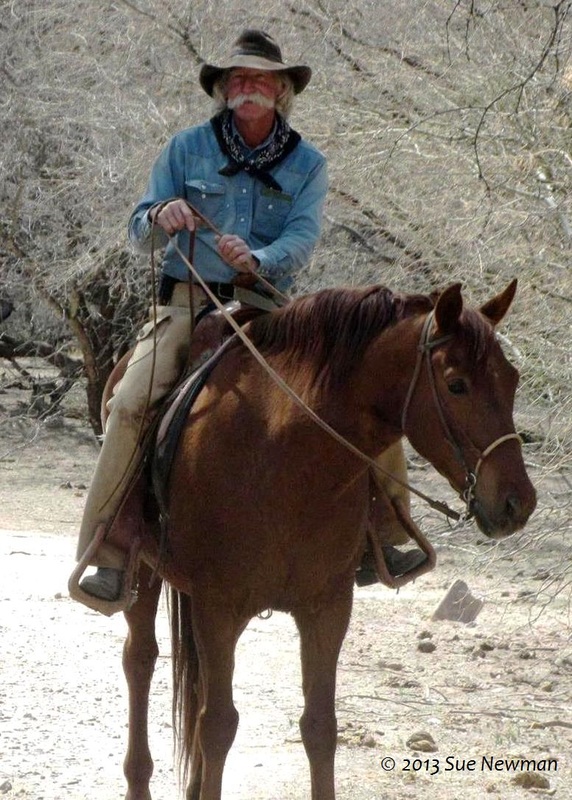 The rest of us swiveled around, and he volunteered to ride Yaqui across the flat and up a ridge, to get a closer look. “It looks like it has a white head …”, and he left us. Not much later we could see him and Yaqui appear out of the mesquite and flowering paloverdes to start to climb the ridge below what we could see was a strange and very large bird, a bird of prey–it took off, rose up into the air as if it were being assumed into Heaven but then put on a display of aerial grace and ability that took the breath away, a declaration: “I am lord of the ether.” Then it lowered, curved, and came right over our heads and soared and stilled itself mid-air, and soared away. White head, a black cap, white band towards the ends of long eagle wings: a Crested Caracara! Bob Evans and Ralph and Kathleen Waldt have experienced the rapture of this raptor on The River, but I hadn’t expected to. We four on our horses were ourselves riding on air after the sight of that bird as splendid as it is rare.